Over the course of three years, the photographer Takashi Owaki traveled to fifty-five countries on six different continents. During his travels, he met 1,460 children and asked them the same question: "What do you want to be when you grow up?" Of course, he heard a lot of different answers! 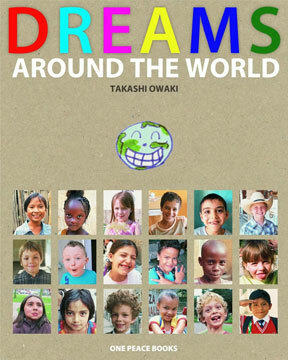 Dreams Around the World introduces readers to 13 of these children who share their dreams for the future, as well as a day in their lives. From Finland to Argentina, Mexico to China, these girls and boys dream about becoming doctors, jockeys, and even kung-fu masters. Full-color photographs, flags, and maps accompany the stories of the children, letting readers participate in a unique cultural experience. In the end, readers will discover that despite being from very different places, they all have at least one thing in common: DREAMS! Takashi Owaki is a photographer from Nagoya, Japan. He has a degree in architecture from Mie Prefecture University and has studied at the International Center of Photography in New York City. His work has been exhibited in New York and Tokyo. He currently lives in Tokyo.